Miramontes Capital | Retiring at the end of the year? Here are the steps to take. 18 Oct Retiring at the end of the year? Here are the steps to take. Posted at 13:38h in retirement planning by Brett F.
Fall is just beginning but that also means the year’s end is quickly coming. Knowing that your retirement is approaching can be very exciting, but are you properly prepared? Here are steps to take if you are retiring at the end of the year. Do you know how much you need to retire? A must-do before retiring is figuring out how much you will need. You will need to factor in your savings, your portfolio, social security and if you’ll be receiving a pension or any other source of money. You’ll also need to calculate what your monthly spending will look like. Your incoming funds and spending will likely change during retirement so it is best to plan ahead what you want your financial situation to be in retirement. Miramontes Capital is happy to help you in this planning process. Do you know what your asset accounts consist of? Check in on your asset account(s) to see what has accumulated and what is too risky to hold onto during retirement. A general guideline for soon-to-be retirees is that you should place only 40-50% of your portfolio in moderate to moderately aggressive investments. The balance of this capital should also be placed in balanced to conservative investments, or bond investments. As you get closer to retirement you will most likely want your assets to present a lower risk. You will also want to make sure your 401k is in good standing as well as any other retirement accounts. Rolling over accounts after retiring is a common practice and you’ll want to ensure your accounts are equipped to do so. Miramontes Capital can assist you throughout the process. Once you figure out how much you’ll need and have planned accordingly, you will need to notify your employer. Most companies require 90 days notice of retirement. Check in with your human resources leader to provide your notice. From there, the company will typically give you a large packet of information that will require multiple signatures on your end. During this process, you will need to decide whether you’ll be receiving your pension as a lump sum or annuity. A lump sum can be helpful if you want to have full control of your money. But a lump sum can be overwhelming for some and for that reason, they choose to take an annuity, a pension given out in monthly payouts. The decision is a personal one and should be thoughtfully considered. Click here to learn more about these options. Retirement is an exciting step in one’s life, but it takes a careful amount of planning to make it happen. Miramontes Capital can help make the process easier and guide you through your goal of retiring at the end of the year. 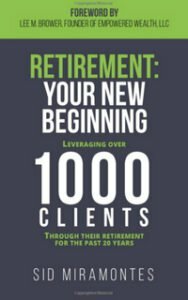 FOR MORE INFORMATION REGARDING RETIRING AT THE END OF THE YEAR CONTACT MIRAMONTES CAPITAL. 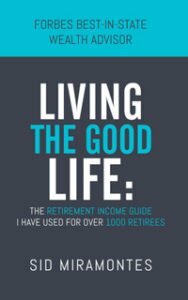 If you’re interested in reading more tips on preparing for retirement, plus real stories of retirees on what they wish they would have done differently, we’ve written a book just for YOU. And the best part – since you’re on my email list, you can get it completely FREE (normally it’s $17.95 on Amazon)!! Click here to get your free copy today. Interested in more information? We’ve created a free workshop where you can come in and meet us, spend time getting to know our team, and get all of your retirement questions answered. There are only 20 seats available for each workshop, and they fill up fast! Once they’re full, you will have to wait until the next one, so reserve your spot now by clicking here. You should leave this workshop feeling confident in what your next steps should be, whether you’re 2 years away from retiring or 6 months. This is your chance to get your questions answered – once and for all! Miramontes Capital is a Registered Investment Adviser. Advisory services are only offered to clients or prospective clients where Miramontes Capital and its representatives are properly licensed or exempt from licensure. This blog is solely for informational purposes. Past performance is no guarantee of future returns. Investing involves risk and possible loss of principal capital. No advice may be rendered by Miramontes Capital unless a client service agreement is in place.